There are as many approaches toward a Manhattan as there are to, well, Manhattan itself. Bourbon or rye? Broadway or the Village? What type of vermouth? See a musical or a drama? Ice or straight up? Cab or subway? No wrong answers. Well, maybe a couple, but we won’t judge. Lately, we’ve had several requests for our own Manhattan recipe. With that request in mind, we thought we would share our thoughts on this great classic, including our own versions. There are as many stories on the history of the Manhattan as there are variations on the recipe itself. The earliest story centers around a bar in Maryland in 1846. John Welby Henderson was a bartender for John Hopkins of Virginia. Hopkins, in April of 1846, was injured in a duel in Maryland. Hopkins was rushed to the Hotel Palo Alto where Henderson was working. He quickly mixed a concoction of Maryland rye, syrup, and bitters to revive Hopkins. No idea how the injured man faired. I mean, they took him to a bar instead of a doctor. Not necessarily a bad call, perhaps. The recipe is rumored to have made its way to Manhattan and became a classic. The more popular story is that Dr. Iain Marshall created the drink in November of 1874 for a banquet at The Manhattan Club. Hosted by Jennie Jerome (aka Lady Randolph Churchill, mother of Winston), the banquet was to honor Samuel J. Tilden, the newly elected governor of New York. Interestingly enough, Jennie Jerome was actually in England at that time, giving birth to Winston Churchill. The actual banquet was held the day of Winston’s christening. Jerome’s only real connection to the Manhattan Club is that the club later moved into a mansion once owned by her father. Yet another account states the drink was created by a saloonkeeper named Black at a bar on Broadway near Houston Street. 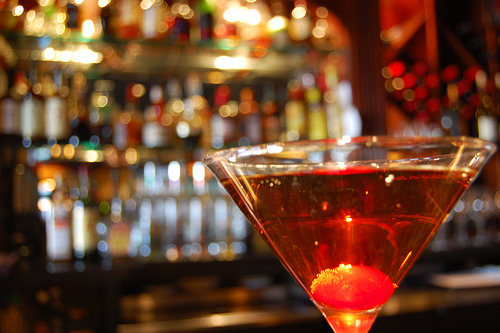 While the history of the Manhattan comes in many variations, one thing we know is true. The Manhattan (along with the Champagne Cocktail) is the oldest cocktail still made the same way it was over 145 years ago. place all ingredients in an iced cocktail shaker, stir (do not shake) and strain into a cocktail glass. Garnish with a cherry. The Manhattan holds a special place in my heart. It is the first cocktail I ever tasted and I will never forget it. Until then I didn’t know combining four ingredients could create such a rich and complex combination of flavors. From the first I was in love and the affair has lasted through the years. Who says love doesn’t last? My affection for this classic has led me to try them all over the U.S. and while a few have been good, most were mediocre and many downright sad. For the record, if you don’t have bitters, don’t bother. So, this has lead me in pursuit of my own “perfect” recipe. I stumbled upon my preferred recipe when Katruska and I were in the Sondheim show Company. During the run we decided we would create cocktails representing our characters and share them at the cast party. I almost always prefer bourbon in my Manhattan and since my character, Harry, had “problems” with this most delightful of whiskies, it was my base liquor of choice. The result of my experiments was the Harry’s Dilemma which added Heery’s cherry brandy and reduced the sweet vermouth in the mix. But, as with our lives, we change and grown and so has Harry’s Dilemma. Below is my current “go to” version. Enjoy! Combine first four ingredients in a cocktail shaker with plenty of ice. Stir until cold and strain into a chilled cocktail glass. OLN lab time always begins, and most of the time ends, with a Manhattan. I don’t know if I love Nicky’s Manhattans because they are so good, or if simply because he makes them and I don’t have to do the work. But our recipes are similar and really only change with the third mystery ingredient. 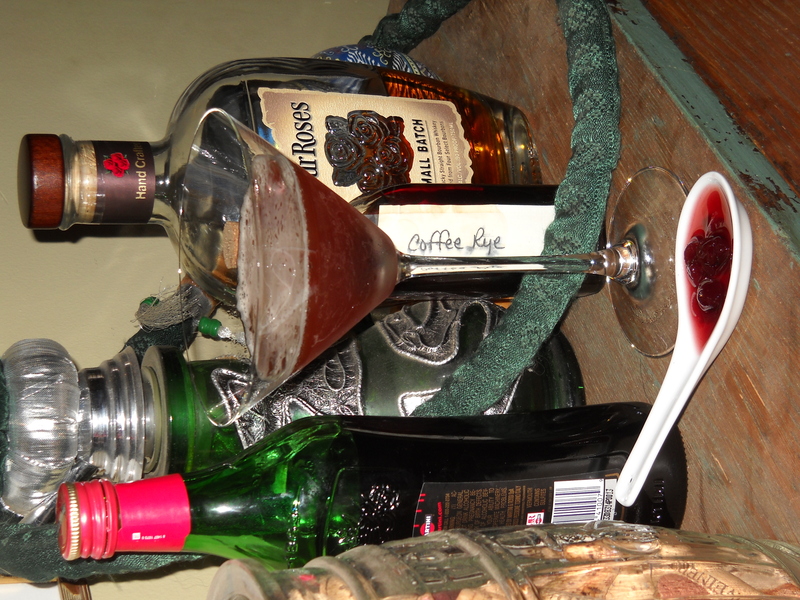 I make my own cherries, using my own coffee-infused rye. After the cherries have settled a week or so, I bottle a good portion of the syrup created in the process and use this in my Manhattan. However, I have also used whatever strange and wonderful concoction is currently in the refrigerator. A friend recently gave me a homemade Camellia flower syrup/shrub that I’m using now. Because the third ingredient is usually of a sweeter nature, I tend to go with rye as my base – Bulleit rye to be precise. But many times I will defer to bourbon and go with Bulleit or Four Roses Small Batch. And quality vermouth is essential for me. Nicky and I have both begun using Carpano Anitica and I will never look back. While I love the whiskey barrel aged bitters, I sometimes don’t like the way the spice plays with the Carpano Antica or the mystery ingredient of the day, so I’m good with using Angostura. Place all in an iced cocktail shaker and I do shake mine. I like the cloudy froth. 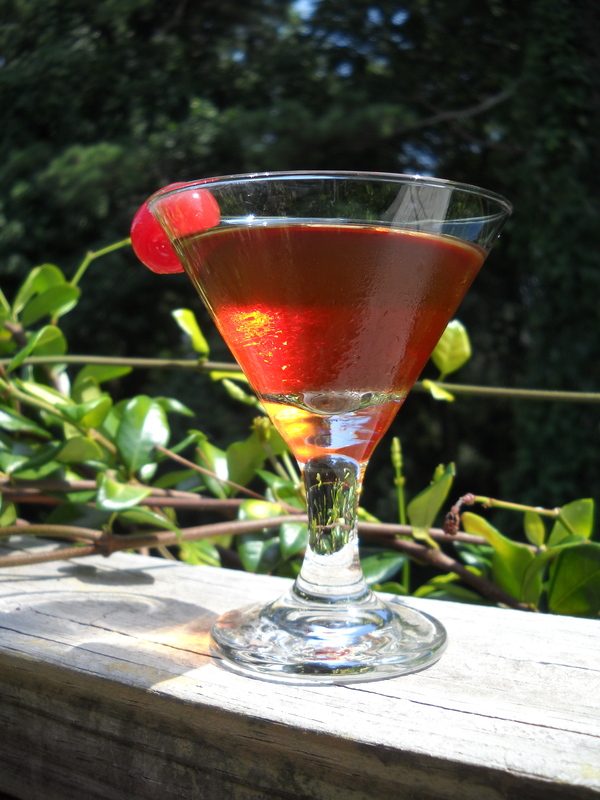 Add a brandied cherry – never maraschino. The classic Manhattan is such an easy cocktail to keep on hand at home. Let us encourage you to pick up your choice of the ingredients used in our recipes and begin tonight! This blog really looks great! It was also great to meet you both last week. I’ll be sure to pass along this wonderful blog to my friends at UD. It was nice meeting you all as well! Glad you looked us up! I work for a production company in New York City. 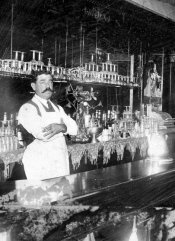 We are in the process of finishing our untitled cocktail documentary and I just wanted to confirm a quote to license the still black and white image of a 1900s bartender featured in this post for inclusion in the film. Please let me know if you are the best person to talk to about this- and if so, if there is any other information that I can get from you. My apologies for the delay in response! We do not own that image and found it on the Net via a Google search. Best of luck with your film and let us know where we can check it out when it’s done. on your own web based line of work. site and quickly developed a terrible suspicion I had not thanked the website owner for those secrets. These men were definitely as a result glad to learn all of them and already have very much been taking advantage of these things. needing to discover. Our honest apologies for not expressing appreciation to you earlier.